From Twitter sensation broodingYAhero, a hilarious parody "how to" (told as a fiction/non-fiction hybrid) on the world of YA books, writing, and finding your inner main character.<br></p><p>Have you ever wished you could receive a little guidance from your favorite book boyfriend? Ever dreamed of being the Chosen One in a YA novel? Want to know all the secrets of surviving the dreaded plot twist?<br><br>Or maybe you're just really confused about what "opal-tinted, luminous cerulean orbs" actually are?<br><br>Well, popular Twitter personality broodingYAhero is here to help as he tackles the final frontier in his media dominance: writing a book. 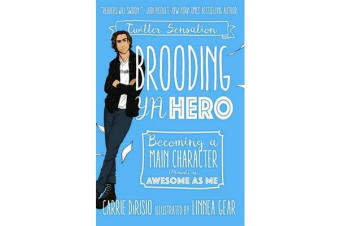 Join Broody McHottiepants as he attempts to pen Brooding YA Hero: Becoming a Main Character (Almost) as Awesome as Me, a “self-help” guide (with activities—you always need activities) that lovingly pokes fun at the YA tropes that we roll our eyes at, but secretly love.